“U.S. 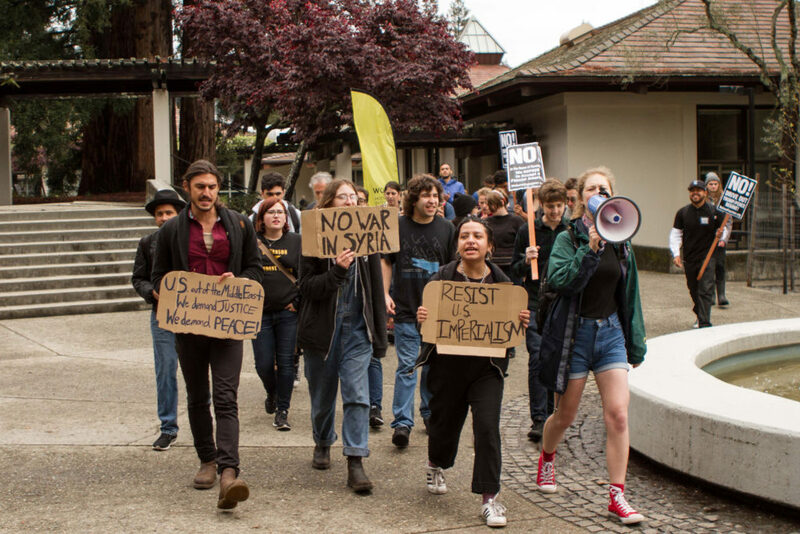 out of the Middle East, we demand justice, we demand peace,” shouted a circle of about 35 students and community members in the UC Santa Cruz Quarry Plaza on April 12. Demonstrators protested the recent U.S. military airstrike when 59 Tomahawk missiles were fired at a Syrian air base on April 6. Students and large tour groups walked through the circle of protesters and took notice of the group’s informational speeches, which called for justice and denounced American intervention in the Middle East. Demonstrators condemned the UC for allegedly investing money into corporations that contribute to military weapon manufacturing for the federal government. After occupying Quarry Plaza for about an hour, the group moved through Cowell and Stevenson colleges, entered the dining hall and ended with calls for action in the lobby of McHenry Library. “We are trying to organize an anti-war movement on campus,” said third-year protest co-organizer Haik Adamian. He said there was a lack of coherence between different student organizations that ultimately share the goal of justice and equality. 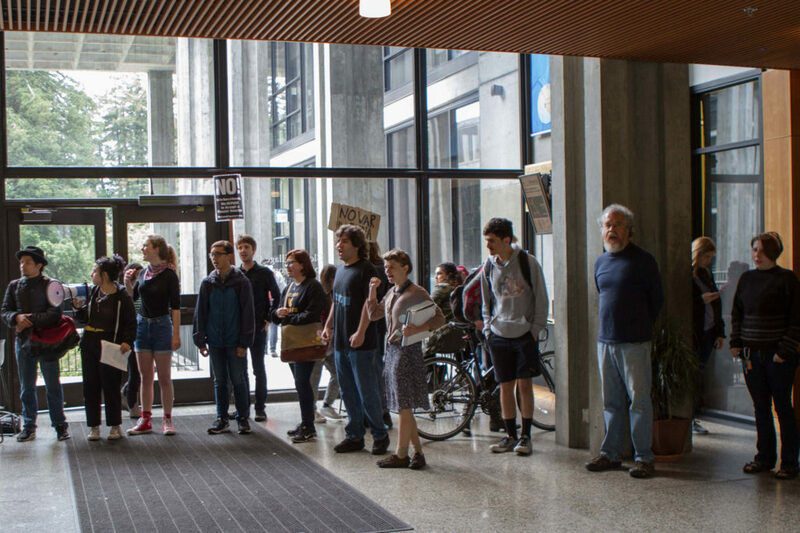 This anti-war movement would include the UCSC March Collective, which organized the protest. The March Collective was involved in organizing past protests, including one on International Women’s Day, and is planning a demonstration in May to show solidarity with refugees, migrants and workers. The U.S. military action, a response to a chemical attack by the Assad regime on Syrian civilians, is a sharp change in rhetoric for President Donald Trump, who had previously been vocal in his anti-intervention stance on Syria. But some experts say the move was calculated and a politically charged distraction from domestic shortcomings. “The U.S. strikes were political theater, designed to distract, raise poll numbers and attempt to show other world leaders that Trump won’t hesitate to use force,” said UCSC global politics lecturer Shawn Nichols. While U.S. politicians’ responses were still calibrated along partisan lines, more than three-fourths of senators have shown some degree of support for Trump’s action and only six have decisively condemned the intervention. Public support also seems to be marginally in favor of the move. A YouGov poll showed 51 percent of respondents either strongly or somewhat supported Trump’s actions. When asked if they approved of how Trump is handling Syria, 42 percent of respondents also either strongly or somewhat approved compared to the 37 percent who somewhat or strongly disapproved and 22 percent who were unsure. Protesters chanted, “From Palestine to the Philippines, end the U.S. war machine,” as they widened the focus from the missile strike to American imperialism and oppression at large. Third-year Daniel Baca was sitting in McHenry Library as protesters came in and gave speeches. He expressed a concern that perhaps the public does not yet have enough information to truly understand and oppose the intervention. “I always think that when there is an issue at hand, even if I don’t completely agree with [the protesters] I think it’s good that they do this,” Baca said. Though White House Press Secretary Sean Spicer said in March the Assad regime in Syria is a “political reality that we have to accept,” he has now said “further action will definitely be considered” in Syria if necessary. As the White House has flip-flopped its stance on Assad, intervention in Syria and its plans for further action, the future of the devastation remains blurry.